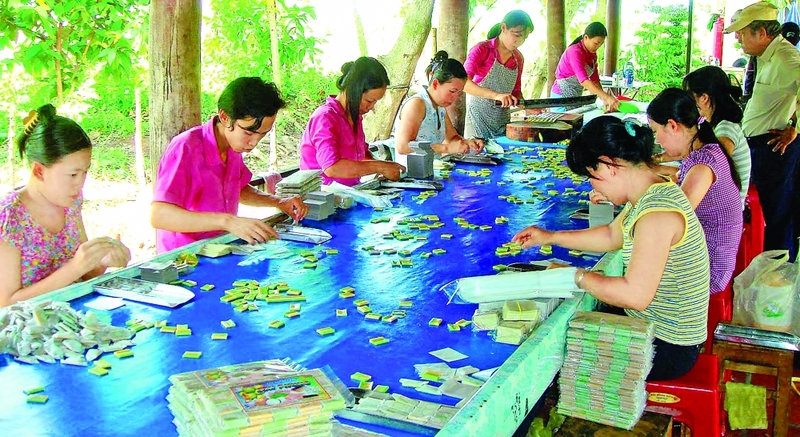 (VEN) - Every year, craft villages in the Mekong Delta get busy several months prior to the Lunar New Year (Tet) making specialized products to serve consumer needs on this major holiday. My Long Village in My Thanh Commune, Giong Trom District, Ben Tre Province has for a long time been known as a rice paper supplier for the southern provinces. Visitors to the village in the weeks leading up to Tet cannot escape the sense of excitement and anticipation of residents and workers alike. According to Ben Tre Province authorities, in the past, rice paper production in Giong Trom District was small-scale and mostly for sale to families in the locality. The craft has been developed gradually. Currently, there are more than 240 rice paper production facilities in the district, which supply the market with over 500 reams of rice papers (each ream consists of 1,000 sheets) per day, earning more than VND100 million. These facilities have generated jobs for more than 700 local workers. 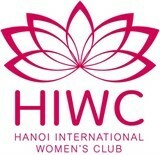 The rice paper craft and related service jobs have provided a living for over 40 percent of households in My Long Village. Rice papers made in this village are sold in not only Ben Tre Province but also other southwestern provinces, to both domestic consumers and foreign tourists. Coconut candy is another well-known product of Ben Tre Province. The product was introduced by skilled women in Mo Cay District in the 1930s and the craft has since been passed down. People buy coconut candy for children and guests or to give their relatives and friends as a gift. The candy craft has expanded beyond Mo Cay District to a coconut candy village in Ward 7 of Ben Tre City. The materials used to make the candy have been diversified to create attractive products in terms of color and flavor, including quality glutinous rice, dried coconut, high-quality sugar, chocolate, durian, pineapple leaves and groundnuts. Leaving Ben Tre to the nearby Mekong Delta Province of An Giang, one can visit a village in Phu My Township, Phu Tan District, which specializes in making glutinous rice flatbread. Nobody knows when the delicacy was first made here, but residents say the golden age of the craft was during the 1930s and 1940s. 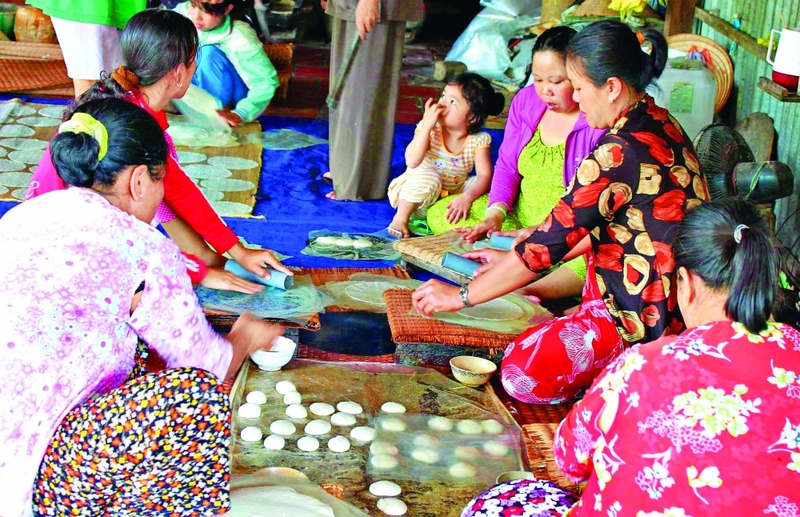 At that time, more than 50 households in the village made millions of glutinous rice flatbreads for sale prior to Tet. Today, this product is made mostly in Thuong 3 Hamlet of Phu My Township, which stretches along the Tien River bank to the area adjacent to the Vam Nao River in Cho Moi District. The village makes glutinous rice flatbread all year round. However, it often gets busier during the months prior to Tet, with 40-50 production facilities. During the rest of the year, only about 20 production facilities are involved in this activity. Locals make the flatbread from quality glutinous rice. In the past, they made it by hand, but today, major production facilities use electrical machines to increase productivity and reduce labor. Chinese sausage and pia cake (made of green beans, durian and Indian taros) are specialties of Soc Trang Province. They are products of Vung Thom Village, Phu Tan Commune, My Tu District. They were first made there by people of Chinese origin about 500 years ago. 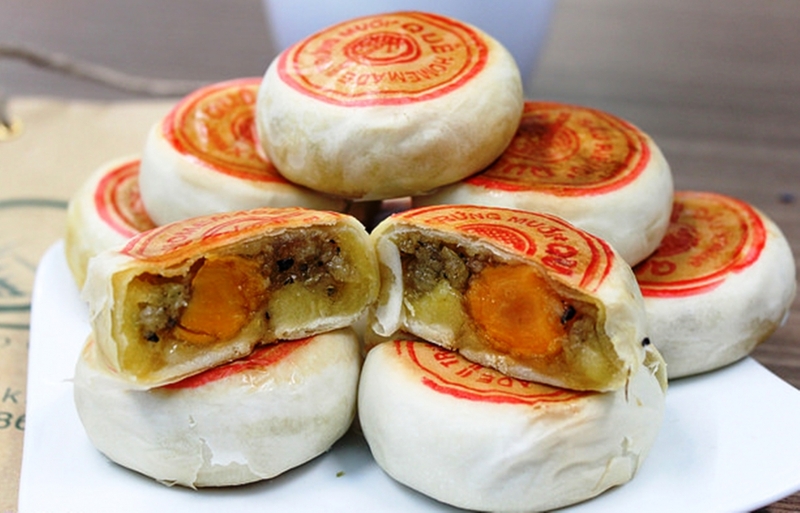 Today, Chinese sausage and pia cakes are made mostly by production facilities in Soc Trang Province. Many have mechanized production, using advanced techniques and modern machinery to ensure product quality and international-standard food safety. According to Vo Van Chieu, Director of the Soc Trang Province Department of Industry and Trade, the locality not only sells pia cakes and Chinese sausage domestically but also exports the specialties to the US, Australia, Hong Kong (China) and Cambodia. The province exports about 10,000 tonnes of pia cakes made according to HACCP and GMP standards and 3,000 tonnes of Chinese sausage annually. Chieu said the development of these products has enabled the provincial agricultural sector to ensure stable sales of pork and beans (pork is the main ingredient in Chinese sausage, and beans are used for pia cake production), helping maintain traditional craft villages that have existed for generations.